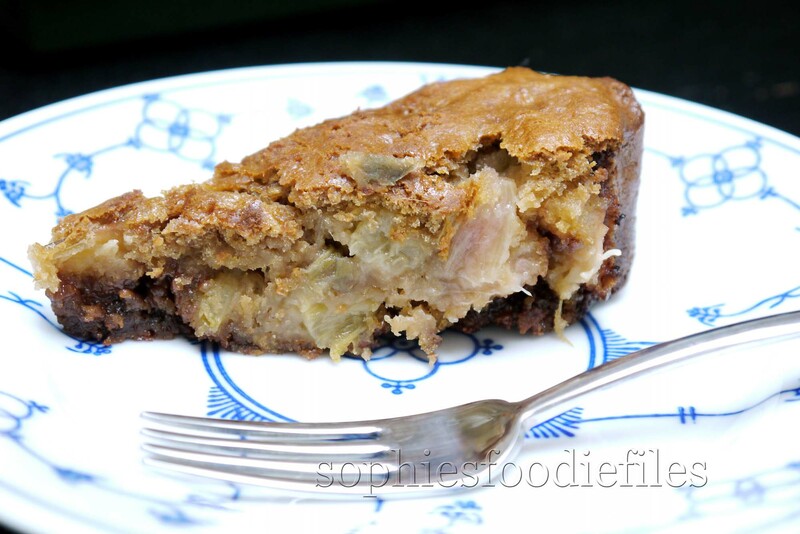 A divine & good for you spelt vegan rhubarb cake with chocolate chips! Yum Yum! 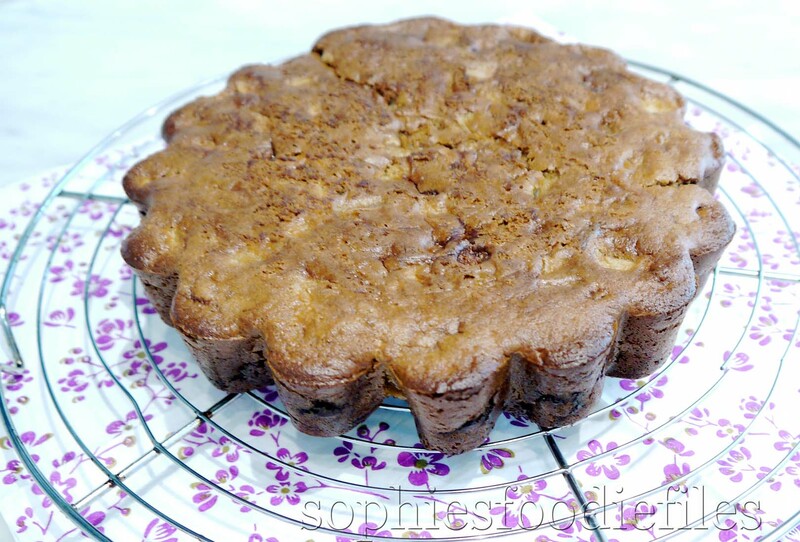 A lovely & healthy vegan spelt rhubarb cake with chocolate chips! Yesterday, I made this tasty vegan invented rhubarb cake with DF chocolate chips. I used light spelt flour to make it much healthier. I also used a vegan buttermilk. This cake looks stunning, right? I used a silicon baking form because I only bake with silicon baking materials because it is so easy to use. You don’t have to grease the moulds & you let the cake sit for 10 minutes in the baking tin for a lovely shine on your cake, after baking. That’s typical for silicon baking. It also comes out very easily too. 🙂 This cake is divine ,eaten still a bit warm or cold with a good cup of tea. Mix all the spices well together & place in a fitting bowl & screw the lid well on. Shake well until all joined. Use 1/4 teaspoon for this recipe! Enjoy!! It works really well!!! 1. First make your vegan buttermilk. Take your soy milk & add 1/2 tablespoon of lemon juice. Mix well with a mini whisk. Let it stand on room temperature for about 15 minutes. Set aside. 2. Preheat your oven to 170° C ( 325 F ) for 10 minutes. I always use a fan heated oven. Adjust your oven to the right temperature. 3. I use my Kenwood. I put the K-paddle in. Place the fitting bowl & add sugar & soy yoghurt. Mix for a few moments to combine beautifully. 4. In another bowl, add the flour, the salt, the baking soda & the baking powder, all evenly divided. Mix well with a spoon. Now, add the flour mix gradually to the sugar mix. Let the machine turn, mix continuously & add some of the flour mix & wait until it comes together & then add some more, etc, etc. Turn the machine up a bit for a thorough mix. Scrape the sides & turn again.Now, add the vanilla & turn again. Add the vegan buttermilk, gradually until it is all emulsified. 5. Add the rhubarb pieces, chocolate chips & speculaas spices. Mix well until it all comes together. Mix & scrape down the sides. My chocolate chips got stuck on the sides of my bowl. I don’t know why? Divide the chips well into the batter. 6. Place your flower patterned silicon tin on a Silpat & on an oven wire rack for stability. Now, pour the batter all over the sides & in the silicon mould. If there are chocolate chips left on the bottom of your Kenwood pot, place them all in your mould, equally divided. Place in the center of your oven & bake for about 45 to 55 minutes. I checked after 40 minutes. The middle of my cake wasn’t ready & still undercooked so I added 10 minutes. I added another 5 minutes & tested with a small test pin & my cake was finally ready. Carefully, place your wire rack out of the oven. Leave the cake to rest for about 10 minutes in your silicon mould. Then, carefully remove it & place it on a wire rack to cool down completely. My cake could break easily, so be careful. When cold, transfer to a chopping board & slice up. Devour it & be proud of your glorious creation! 🙂 I assure that you want more than 1 piece! 😉 Happy eating! 🙂Stay tuned, Subscribe by email through the link below to get my new cool newsletters aka posts! Join 1,850 email Subscribers! It is free! Previous Post Vegan & gluten-free sweet potato, new peas & smoked tofu burgers! Next Post Orange marmalade marinated pork chops & garden update! I love rhubarb cake and love your silicone mould – I find vegan cakes are often fragile but they usually taste good so with careful handling they are great! This looks great! I love rhubarb. Gorgeous! Are you joining the Virtual Vegan Potluck?? Looks as if you’d come up with something amazing! The speed at which you publish is astonishing as the delicious contens of your dishes and the amazing colourfulness of your pictures! j’adore la rhubarbe : délicieux gâteau ! My rhubarb is up and grinning at me in the garden. Saving this. It does look all shimmery and welcoming. I have yet to bake with silicone – someone told me that it is hard to get them in and out of the oven! Loving how you increased the healthy quotient! I don’t agree! I place my filled silicone mould on a silpat & that on an oven rack for stabity right from the beginning, just prior to the filling! I am using silicon baking pans for more then 9 years now! This is a lovely creation Sophie!! My rhubarb in my garden is growing well, and I’ve been looking into recipes that I can use it in!! What a beautiful looking cake. I think the combination of rhubarb and chocolate would be amazing. Great ingredients! rhubarb & chocolate is the best win wnin combination! I haven’t paired them together before! I used light spelt flour here for not being to heavy! You must do that! It has a great mild nutty flavour! This looks quite tasty! Very healthy too. I just need a really good cup of coffee. Never??? You must try it , it is a bitt sour in taste but you can’t eat it raw! Never must you eat the big leaves: they are toxic! This does look quite wonderful, such a unique combination! Ooooh! What an interesting recipe. We don’t have rhubarb around here yet, but when we do…look out! I’m giving this cake a try. It is! And it tastes heavenly!! Gorgeous cake Sophie! I can’t wait for local fresh rhubarb…it is just around the corner where we live…yummm! Sophie, I love rhubarb and this looks delicious. Also like the shape of the pan you used to bake it. So cute…like a flower. So creative. I need to find vegan buttermilk and fresh rhubarb. thanks a lot! 🙂 You make your own vegan buttermilk as stated above! You can’t find it made! I love the speculaas spice mix Sophie, and spelt flour. Sounds like a lovely combination of flavours! thanks & this spice mix you can use in whatever you want:: sweet or savoury!